As I hung the bird’s nest decor last week, it made me think about why I like nests and what they represent. To me, they symbolize that a home is not just a building or place you sleep at night. It should be a haven – a place you find refuge, encouragement and inspiration so you can better perform the tasks of your day. 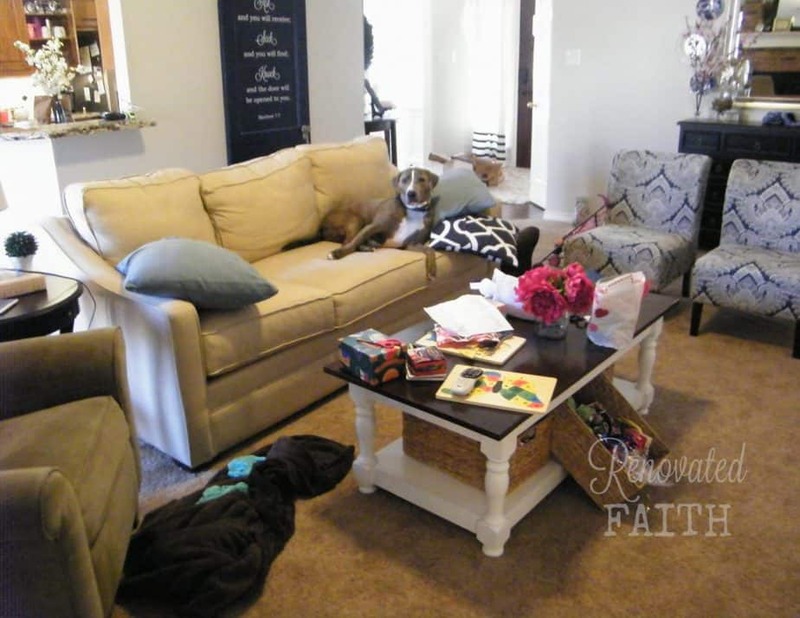 In this post, I’ll share 5 ways to turn your house into a haven that are easier than you think! 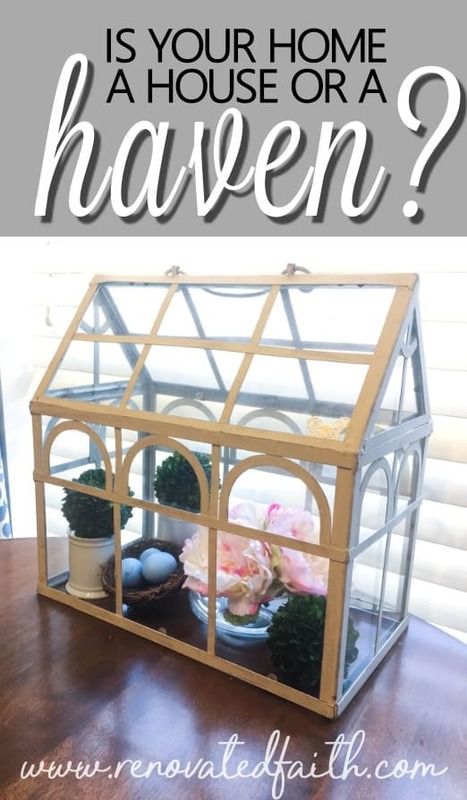 But What is A Haven Anyway? a harbor or port – That suggests a place to always come back to. a place of safety – Your home should be a physical, emotional and spiritual refuge of safety. a place offering favorable opportunities and conditions – This one is my favorite! A home should not only protect you but also spur you on and inspire you toward your God-given purpose! I don’t know about you, but I’d love for my home to be all these things! As we know, a home is more than just paint and decor. It is a refuge that houses the day-to-day activities of our lives. Therefore, adapt your home decor and furnishings to serve your priorities. But to do this we have to remember our priorities and build in routines that honor them. If one’s home is a ship, the ship does not function well when it’s captain goes rogue into uncharted territory. I have noticed that nothing in my home functions as it should when my priorities are out of wack. 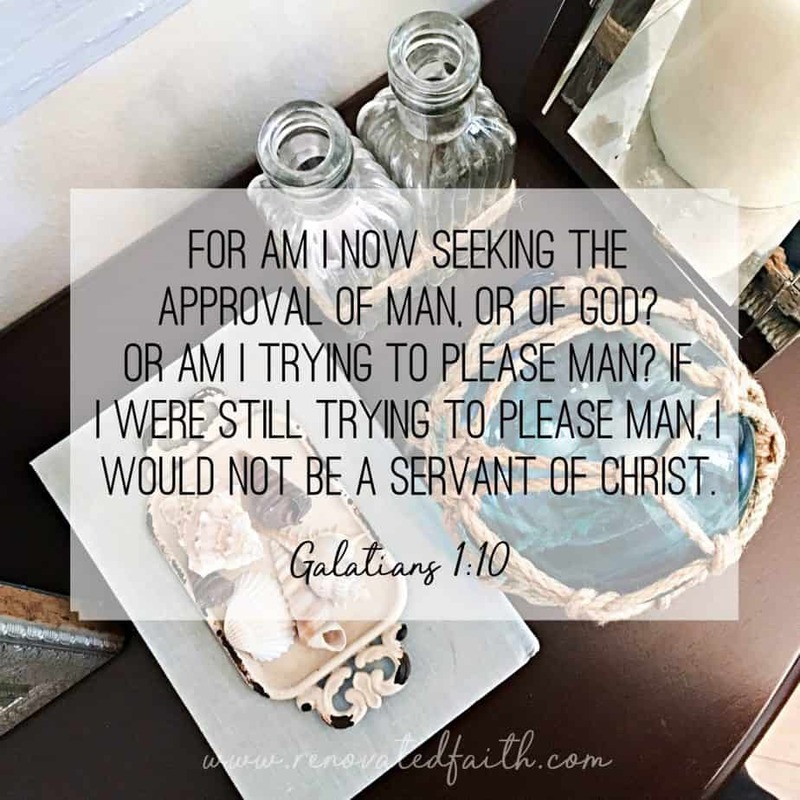 For one thing, I have a tendency to over-commit to projects, and activities that don’t align well with what serves God and our family best at the time. As I wrote in my post How To Escape The Overcommittment Trap, when I take on too much, I get easily frazzled and my true priorities quickly capsize along with everything else. So, I have a weekly schedule that helps me focus on my purpose and allows me to run our home effectively. Maybe for you this is a monthly meal plan, a commitment to spend time in the Word every morning or just simply making sure you take time to relax or unwind. Your home will function at it’s best when it’s activities embrace it’s true purpose. A haven is an intentional refuge where I focus on who and what matter most instead of the noise of the world. A home is a haven, not because it is Pinterest-worthy but when it serves it’s God-given purpose. What is the purpose of your home and how do your decor and agenda align with that purpose? Get these FREE PRINTABLES and dozens more HERE! Being on an episode of Fixer Upper or having décor from Pottery Barn does not make a house a haven. A home is a haven when it has sentimental reminders – personal touches that make you feel like you never want to leave. Your home’s decor should remind you of the joy that life brings and those you have shared it with. When I redecorated our bedroom, our budget was tight, which forced me to get a little creative. 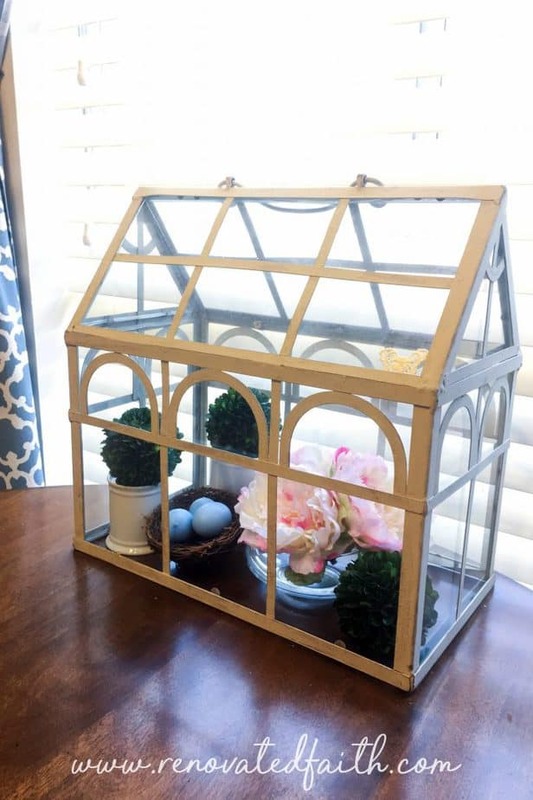 It includes my husband’s late grandmother’s old side table top that doubles as a picture frame, some framed botanical prints that remind me of my grandmother’s garden, a parfait glass of my mother’s that doubles as a candle holder and the list goes on and on. If we had not been in a place where I needed to watch our budget, I would have missed out on all these personal touches that made this space our dream bedroom. A home should tell stories of the people that live there. Your decor should be personal, unfolding the truth and stories of a life well-lived, embracing the past and savoring the present. What are some personal touches that you can add to your home? What things are in your home already that make you smile because of their sentimental connection? A haven encourages hope and uplifts me on hard days. 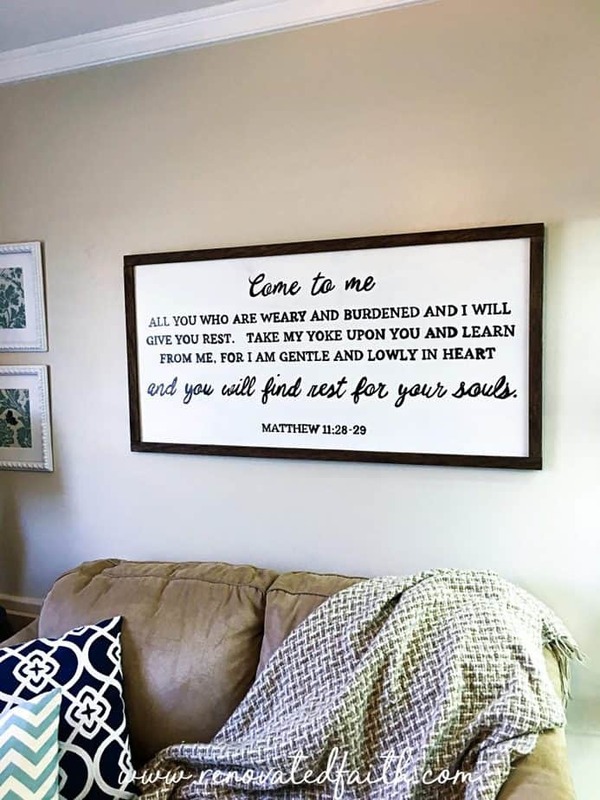 For this reason, I like to include a lot of Scripture in my home and I share ways to decorate with Scripture in my new post here. Sayings and quotes are great, but there is power in God’s Word unlike any other written text. Seeing Scripture art reminds me of His truths and the hope I have even in the most difficult of times. 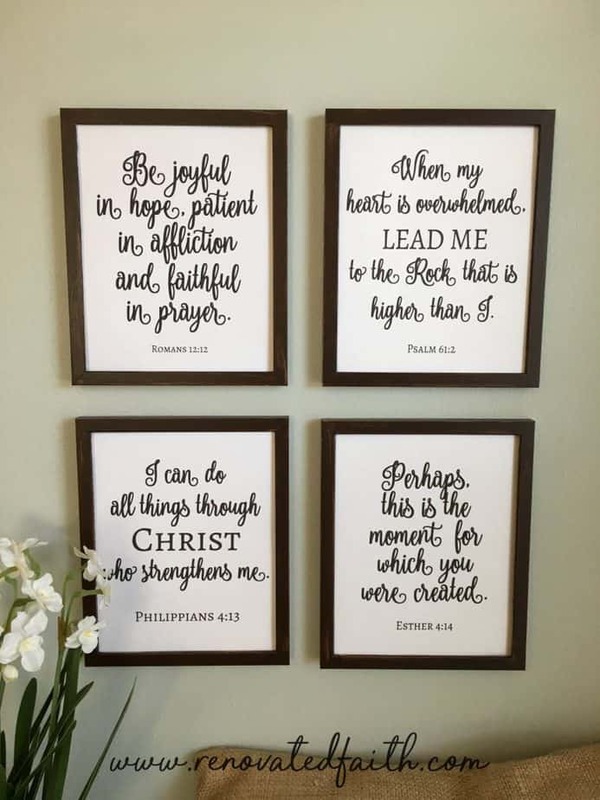 Framed Verse Wall Art – Click HERE! My favorite example of this are the framed verses in our bathroom. My husband and I each picked two verses that had a lot of meaning for us. I think you can tell who picked what! (HINT: My husband is a civil engineer!) Also, I made a wooden sign with my grandmother’s favorite verse. As someone who is a worrier, it provides me with a lot of peace and rest whenever I see it. 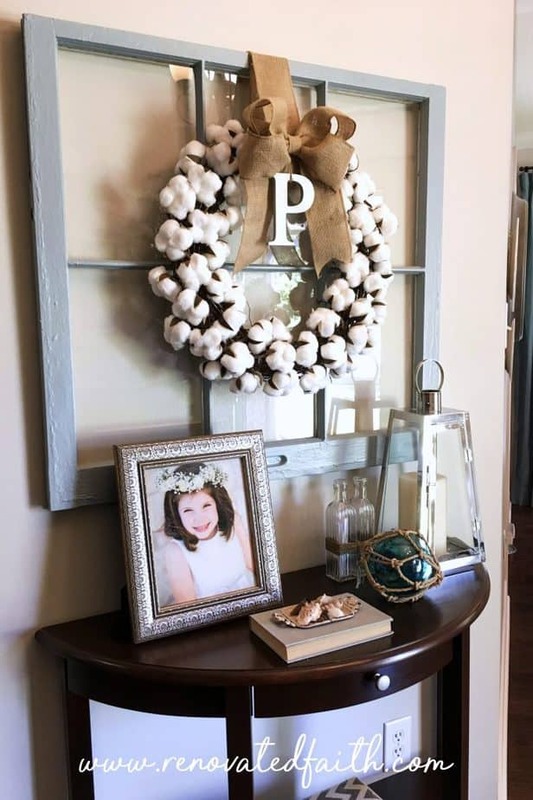 DIY Farmhouse Sign – Click HERE! Also, I have framed printables in our dining room. I love these because they are easy to change out every so often. You can download your own from dozens of choices by going HERE. They all have complimentary fonts and styles so you can interchange them to create your own gallery wall art. 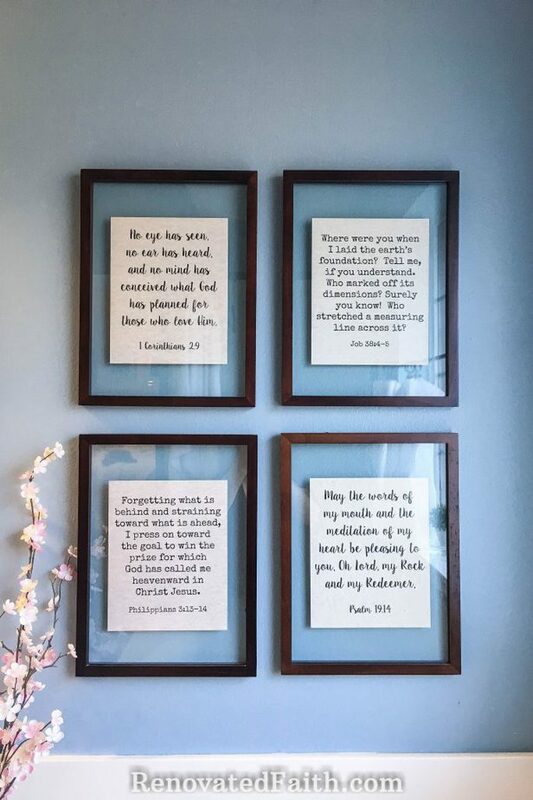 You can see all these ideas and several more in my post 8 Cute Ways to Decorate Your Home with Scripture. A home should complement your lifestyle, not impede it. When I think about livable decor, I think about our coffee table. Jeremy and I put it together and then I refinished it using my gel stain method. Then, I finished it off with 5, yes 5 coats of semi-gloss polyurethane because I wanted it to hold up to unlimited cold drinks on the surface and the occasional scratch from our puppy Jake. Is a shiny polyurethane finish “in” right now?” Nope! But I wanted to make sure it could stand up to our day-to-day routine. 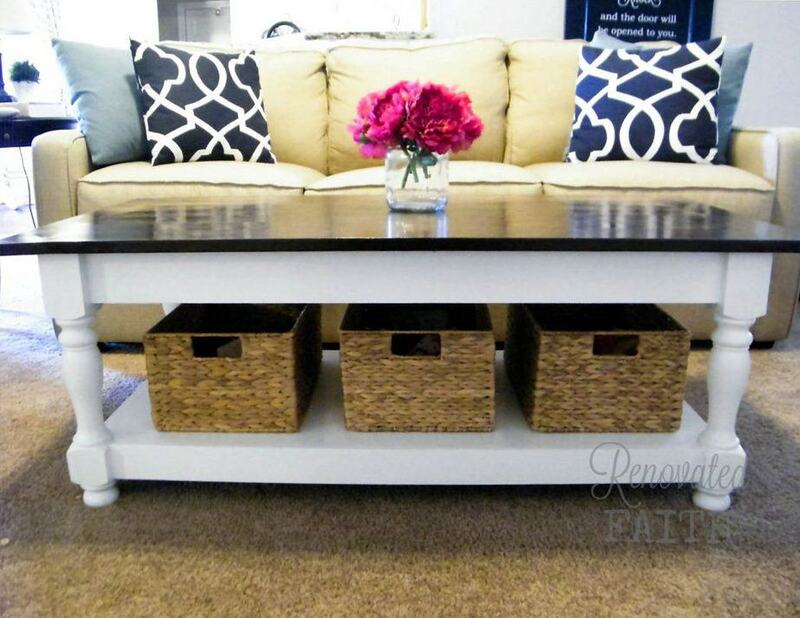 DIY Turned Leg Coffee Table – Click HERE! My point is you make your decor live up to your families activities, not the other way around. Your home should serve the people that live in it while providing inspiration, not perspiration. In our living room, there is an end table, with a small lamp that I spray painted navy at one point. At first glance, it looks like a regular lamp but if you look closely, you can see it has no cord and no light bulb! That’s because it gets knocked over 5 times every day and our dog tried to chew the cord. Is it functional? Not even a little bit! But it looks decent in a place that needs a tall decorative piece and stands up to our level of destruction. OH, and I feel like I wouldn’t be completely transparent if I didn’t show you the normal state of our living room before taking the coffee table pic! Use decor and colors that inspire you! So much of the decor trends in the last couple years have beckoned us to a slower, simpler “farmhouse” feel in an effort to push against our hectic schedules and endless distractions. Those white walls and gray tones are like visual xanax that quiet our moods and calm our senses. The farmhouse trend has seen the height of it’s popularity and may slightly morph into something else but the lesson we can learn is that decor effects your emotions! The colors and style you surround yourself in will affect your moods and your day so pick what inspires you! If you are crazy about blues, go for it with blue and white throw pillows and a blue piece of furniture. Do you love reds but don’t feel they are ‘on trend’ right now? Who cares!?! Do what you love and embrace it! But what if you have farmhouse decor and coastal decor all intermingled in one shelf?!? That’s absolutely fine. There is no hard and fast rule about styles of decor except that according to Jennifer Allwood is it actually no longer a trend to go with all one style – it’s actually better to mix styles. So break the rules with confidence! 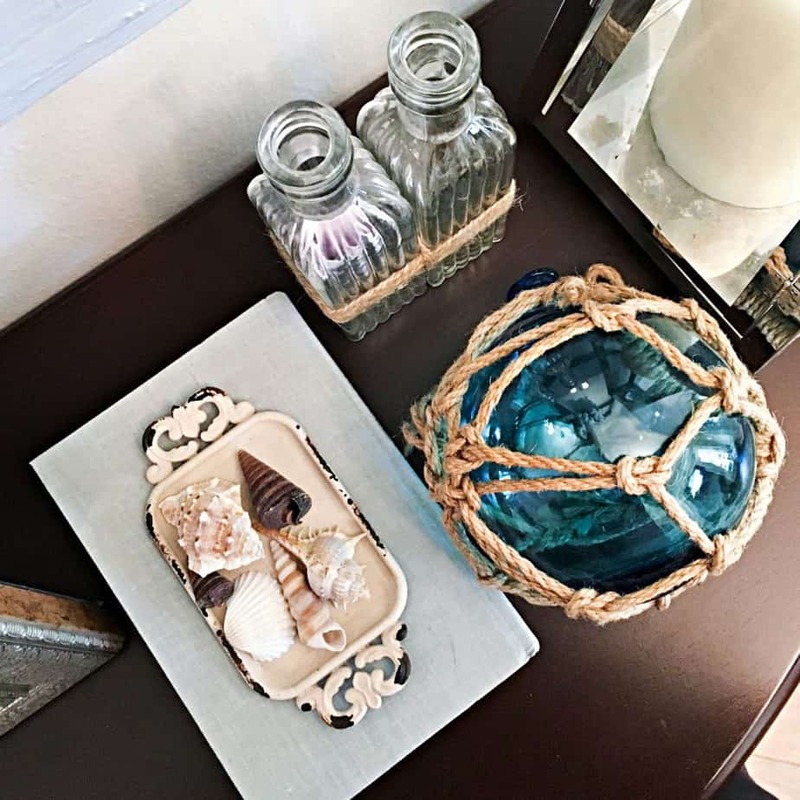 Mix that coastal decor with farmhouse and embrace the different aspects they bring to the atmosphere of your home. Is coastal farmhouse even a “thing”? I think it should be! Seriously though, God has given you your unique tastes and style so infuse your personality into your home. For these are the aspects of your home that make it truly beautiful. Also, don’t forget to let the light in opening blinds and hanging your curtains with this method to get the most light in! You’ll be surprised the effect it has on your mood and it will be interesting to see how your paint colors lighten and darker as the light interacts with them. (Some affiliate links are used in this post for your convenience). I also like to diffuse my favorite essential oils in a diffuser to make my home not only visually beautiful but also smell lovely too! Out of My 5 Ways To Turn Your House Into A Haven, what is the one that most appeals to you? 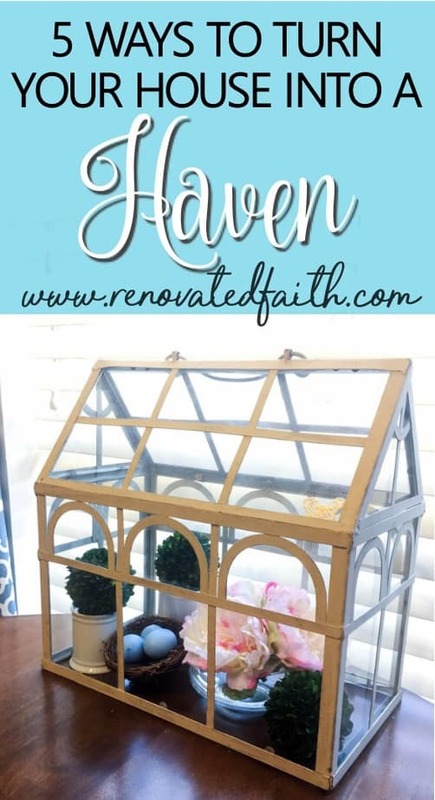 What are other ways to make a house a haven? I’d love to hear your thoughts in the comments! 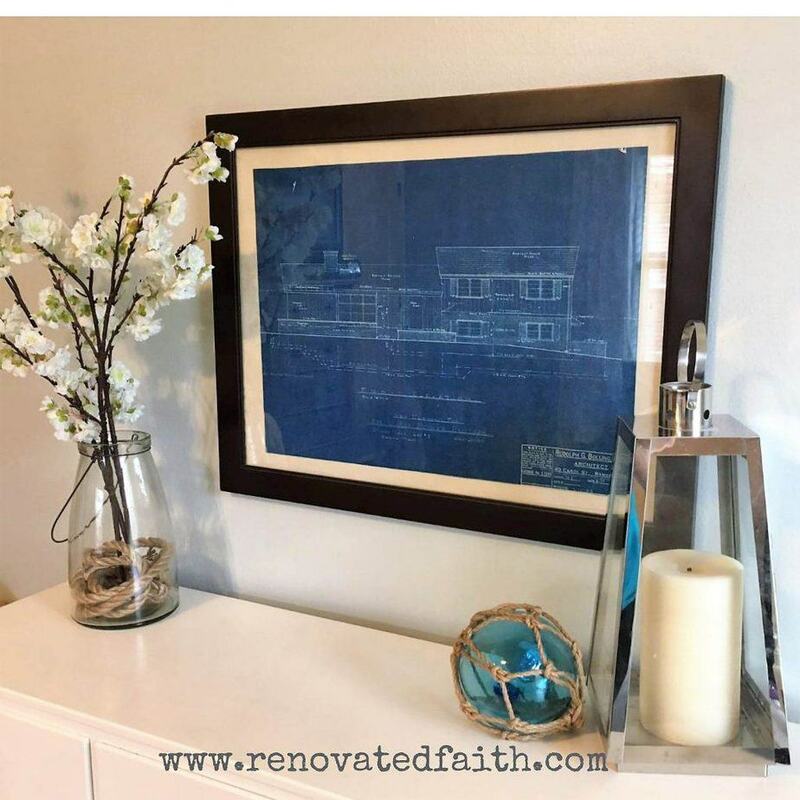 Don’t forget to download your free printable wall art! Did you like this post? Be sure to share it with others. Have a wonderful week! Be sure to follow the fun here! Subscribe to my weekly newsletter full of inspiration, DIY tips, & budget design strategies. You will also get access to my free printables library, including two dozen complimentary Scripture printables. Sign up to receive over two dozen complimentary Scripture printables and get my weekly newsletter full of inspiration, DIY tips, and budget design strategies right in your inbox. So happy you are here! Subscribe to my weekly newsletter full of inspiration, DIY tips, & budget design strategies. 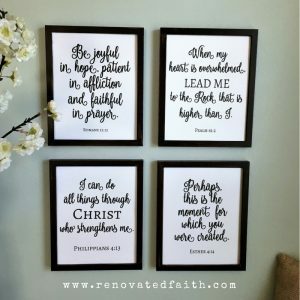 You will also get access to my FREE printables library, including two dozen Scripture Printables & Must-Have Painting Tips!